Encountering an image of mountaineer Malay Mukherjee—who scaled Mount Everest twice in one hour last year—on my social media feed seemed to be the nudge I needed. Almost 13 years ago, Mukherjee had been my mentor for a basic rock-climbing course. Decades later, when I had been looking at a short trekking break from Mumbai, the reminder was a serendipitous one. “If not the highest in the world, might as well try the highest in Maharashtra," I thought, picturing the 5,400ft Kalsubai that lies within the Kalsubai Harishchandragad Wildlife Sanctuary. 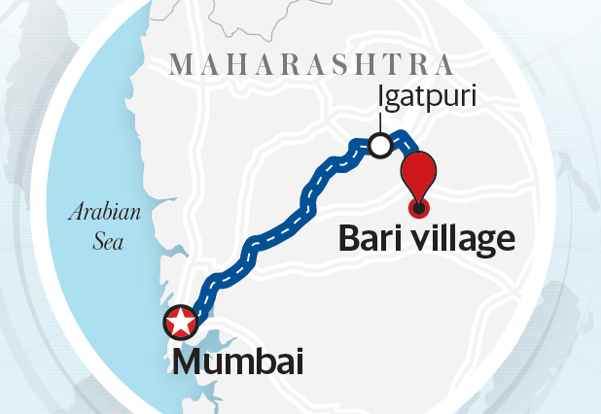 The trek starts from Bari village, an easy 150km drive from Mumbai. Limited electricity and the absence of phone or mobile networks sets the tone for switching off from city life. In the two weeks leading up to the trek, my husband and I spent extra hours at the gym, and arranged for accommodation at a local home-stay. We arrived at the home-stay late one Saturday morning and were immediately rewarded with glimpses of Kalsubai. Even from a distance, one could see the contours of the looming mountain, dotted with grazing cattle and a capillary of blue water rushing down its folds—it was a waterfall. The rest of the day was spent strolling around the village, wedged in natural surroundings and cloaked in mist. We set off on the expedition the next morning, under an overcast sky. We crossed the village and a slim stream to reach a forested patch—the starting point of the trek. Initially, we crossed the muddy trails with ease, but these soon graduated to steep paths. Four times during the trek, our path was aided by steel ladders with railings, propped on the vertical rock face for climbers to haul themselves up. The clouds finally decided to empty themselves over the Sahyadris. While it looked ethereal, the lashing rain made the metal railings slippery and slowed us. We hoped that the clouds would lift and offer a glimpse of the mountains around. Looking up the ladder didn’t offer much hope—the peak was lost to the grey clouds. The 2- to 3-hour trek stretched for an additional hour as we negotiated the narrow steps cut into the stone and rocky path. The place closely resembled the elaborately descriptive locales that I come across in fairytales. Finally, we reached the summit. Soon, the clouds parted and the sun rays pierced through. It was as if the sun and rain had colluded to reward us. The summit has a small red shrine dedicated to Kalsubai, a local goddess, and in the distance you can see the undulating green Sahyadris. We walked around, taking in the stunning views of the Bhandardara dam, constructed on the Pravara river, and the imposing forts of Harihargad, Harishchandragad and Ratangad. Lower down, patchworks of fields in different shades of green resembled an unusual bedspread. After spending an hour at the top, we headed back to the steps, which now seemed trickier, and, most definitely, harsher on the knees. Back at the home-stay, a delicious dinner of bhakri (unleavened bread), batata ki sabzi (potatoes), rice, dal (lentils) and shrikhand (thickened sweet yogurt) was waiting for us. Full stomachs and a safe descent finally allowed for some celebration. Route: Leave Mumbai and take National Highway 160. After Igatpuri, turn right on to State Highway 44, which will take you to Bari village. Trek highlights: Kalsubai Peak is 5,400ft high; it’s a moderate trek, 3 hours one way; the terrain comprises mostly grasslands and rocks. Top tip: Wear sturdy shoes, and carry water and snacks for the trek. Weekend Vacations offers suggestions on getaways that allow for short breaks from metros. Tania Mukherjee tweets from @azureskyfollows.